Shawn "Smith" Peirce's Work - Example: "Who Built That Debt?" Example From RandiRhodes.com: "Chart:Who REally Built That Debt?" This example of how radio can be extended to online graphical journalism comes from September of 2012, in the wake of the Republican National Convention. As the GOP focused on debt during their convention, they conveniently left out who was responsible for that debt. Thankfully,The Center on Budget and Policy Priorities and Ezra Klein created and featured an initial chart that diagramed the causes of the U.S. debt. 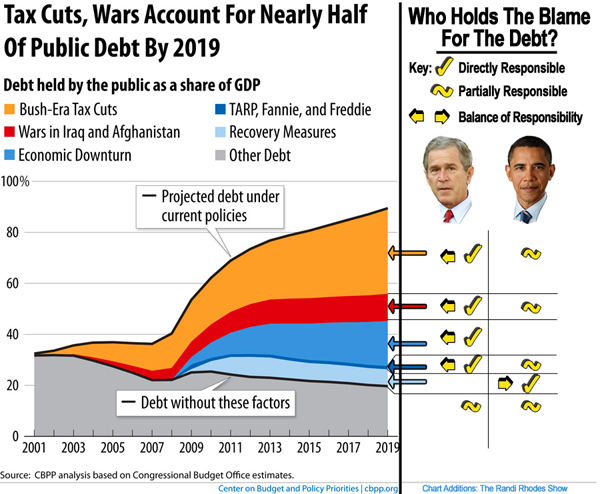 However, that chart did not point out who was responsible for each slice of the debt. So Shawn created this chart, which the Randi Rhodes Show used in live segments, derived from the CBPP and Klein's work, which explained who really was responsible for each chunk of the debt.